Yaki Point is one of the many lookouts along the south rim that provides sightseers with an extraordinary view into the Grand Canyon, Arizona, USA. From this point, one can see Wotan's Throne, an impressive flat top butte and Vishnu Temple, the large pyramid looking plateau. The popular South Kaibab Trail begins at this point. During the summer tourist season the road at Yaki Point is closed to private vehicles. Free shuttle service is available during this time. This image belongs to the travel and nature stock photo library. This stock photo of Vishnu Temple from Yaki Point at Sunrise is available for licensing for commercial and editorial uses including websites, blogs, books, magazines, brochures and advertising. Restrictions may apply for images which contain third party copyrighted material or sensitive subjects. Photos of artwork are for editorial use only. 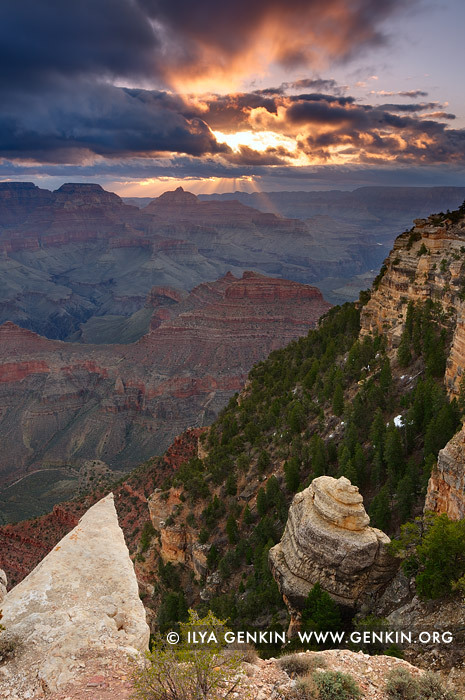 This image id GRAND-CANYON-ARIZONA-US-0005 of Vishnu Temple from Yaki Point at Sunrise, is copyrighted © by Ilya Genkin. This is not a public domain image.